You can count on questions about bears and mountain lions, and even whether you are planning to carry a gun as soon as people hear that you are planning to hike the PCT. Hardly anyone will ask what you plan to do about blisters. This post is a quick overview of common risks that you will actually face, and some of the less common risks. You shouldn't hesitate to get on trail because of these risks ... just be aware of them and take precautions when you can. When I use the term "serious risk," I mean things that take people off trail. I've added some brief comments about my own experience. Overuse Injuries - Shin splints, joint inflammation, painful neuromas, and other over-use injuries plague long-distance hikers. These common injuries tend to kick in after the first few hundred miles of hiking and can take you off trail for weeks at a time. Conditioning before the hike helps and taking zero days early in the hike can also help. I had to take 15 days off trail in 2017 to recover from an overuse injury to my left knee, and it seriously impacted my hiking schedule. Hiking Falls - Many, and maybe most, hikers trip or slip and fall resulting in a scrape or two, and a few percent of hikers have serious falls resulting in injuries that take them off trail. Falls happen on all kinds of terrain, but especially on steep snow, and in icy conditions. I met one woman in 2018 who had broken her leg in the first two miles of trail the prior year, and met many hikers sporting obvious fall injuries. I tripped and fell on trail myself, but was lucky not to be injured. 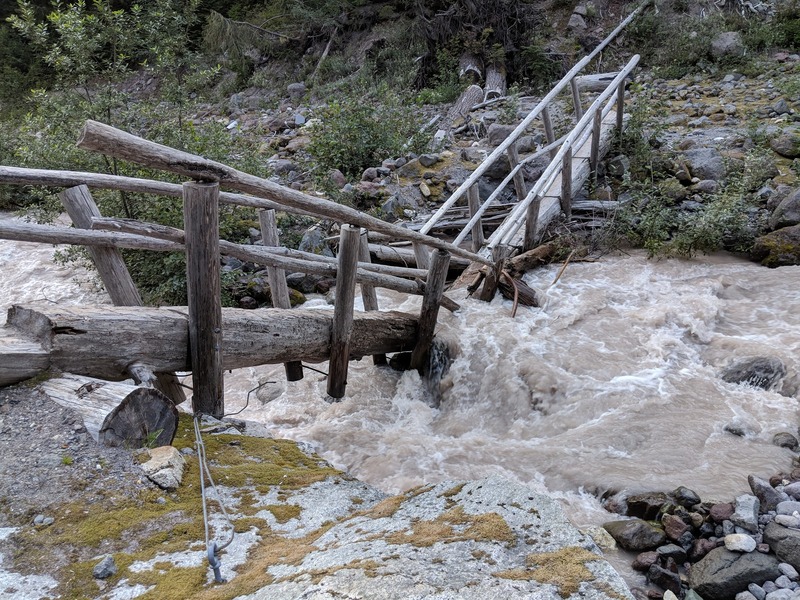 Water Crossing Problems - Due to the high snow levels in 2017, two PCT hikers drowned in the Sierras. This is unusual and was probably preventable; however, many people get wet, and some people have close calls every year. Lost footing during a water crossing can result in anything from a serious injury to simply a water-soaked backpack and unusable phone. I fell off a log at a smaller crossing in 2018 in the early evening and had a cold night with wet gear. Exceptional Weather - You may be fine 99% of the time, but you are likely to catch at least one exceptional weather event, especially if you start early or finish late. High winds and hail can both shred lightweight tents. A heavy snow can obscure the trail, and white-out condition can be deadly since you won't be able to safely navigate. Multiple rain days in a row can make it impossible to get dry and warm until you make the next town. These events can cause falls, navigational problems and hypothermia, and these all can have serious consequences. Hyper and hypothermia - These are almost always the result of unusual weather, poor judgement, risk taking, and/or inadequate gear -- been there, done that. Once the process starts, you start to lose the mental and physical capabilities that you need to get yourself back on track, so these are serious backcountry problems. The early stages are common and the late stages thankfully rare. One simple rule: at the first hint that you are getting overheated or chilled, take action or make a plan to resolve the problem quickly. Homesickness, Boredom, and Lack of Motivation - You won't likely stay on trail if you are lonely and homesick, feel like your relationships at home are deteriorating, are bored with the trail, or feel like your hike has no purpose. I used a Garmin InReach to stay in touch with my wife and listened to audiobooks or music on my phone for a few hours most days. Anti-social Behavior - While most PCT hikers have a positive experience, anti-social behavior can really "kill the vibe" for others. Some women and LGBTQ hikers have commented on encountering an uncomfortable "bro-culture" on trail. Also, some women have had other uncomfortable experiences, and make a point to not camp alone. The dialogue on the PCT pages on Facebook can become critical, disrespectful, and dispiriting. You may see some hikers not practicing LNT. One older hiker commented to me that he felt "invisible" to younger hikers, although my own experience was almost the opposite. Blisters - Although very common, blisters are often preventable by taping your feet immediately when you start to feel a hot spot. But, since most of us wait too long, blisters are a common source of misery on trail. To minimize problems, break in your shoes for 100+ miles before getting on trail and carry blister-preventative tape. Switching to a new pair of shoes the week before your start date is likely to result in blisters! Sunburn and UV damage - Some people get badly burned every year, and a lot of people get an unhealthy overdose of UV during the trail. Most of the burn problems happen in the first few weeks. I am very susceptible to burning, so I hike in long pants, long sleeves, a hat, and sungloves. Poison Oak and Poodle Dog Bush - You are going to encounter poison oak encroaching on the trail in California and Oregon, and poodle dog bush near the trail in Southern California. Most people sidestep these plants and don't get exposed. Rodents - When you camp at heavily-used campsites, mice and squirrels can be more aggressive than usual. Hikers that don't take extra care can end up with chew holes in their tent or backpack. Rodents, and even deer, will sometimes chew trekking pole and/or backpack straps. Dehydration and Electrolyte Imbalance - Most of us are fanatical about carrying enough water for a simple reason: dehydration is very uncomfortable, and then it leads to difficulty hiking, and can spiral down from there. When you are sweating a lot, electrolytes can quickly get out of balance, so you should take electrolytes daily. I met a woman who had to go to a hospital to recover just because she was not taking electrolytes in the desert section. Snow Blindness - At high altitudes on snow it only takes a short time to "sunburn" your eyes. This can result in temporary blindness, which is obviously a dangerous situation. A good pair of sunglasses will eliminate this problem. I only mention snow blindness here because another PCT hiker told me about his hiking buddy becoming snow blind and having to walk him down and set up a tent for him so he could rest his eyes. Opticus can make great sunglasses for trail use to your prescription. Getting Lost - The PCT is such a major trail that it's unusual to "lose" the trail, although it can happen occasionally. Also there are only a few situations when you will be intentionally off the PCT, such as when digging a cathole, hiking over snow, or when on a fire-closure alternate. Still, getting lost can lead to tragedy, so it's important to stay aware of where you are. My phone, with GPS, always worked. In addition to Guthooks, whenever there was a significant alternate, I loaded the National Geographic Trails Illustrated map covering the area into the Avenza app. I also carry a Garmin InReach, a physical compass, and a whistle. Giardia - A few people get giardia or other waterborne illnesses every year because they didn't treat their water. Probably 80+ percent of hikers are very careful about this. My personal options: filter it, use chlorine dioxide tablets, boil it, or trust it (primarily at water caches or campgrounds). Insect bites - There are ticks on the PCT and especially if you wear shorts, there is a good chance of getting a tick on you at some point, and tick bites can lead to serious illness. While spiders are mostly harmless, some are poisonous, and can make you ill. You are almost guaranteed to get mosquito bites, but I have not heard of mosquito-borne illnesses on the PCT yet. Bee stings - Every year some people get stung by bees or wasps. If you have an allergy that makes a bee sting potentially serious, you should probably carry some form of protective gear, such as an insect bonnet and/or medicine to counteract the sting. Lightning Strikes - Especially in the high sierras, you can encounter late-afternoon thunderstorms. If you are coming up over a pass during a storm, it can be pretty scary. A few PCT hikers were struck and survived in recent years. Cars - PCT hikers have been struck by cars while roadwalking, so while we don't spend that many hours walking on backcountry roads, these winding roads with narrow shoulders seem to be especially dangerous. Hitch-hiking - This is an area where most people have great experiences, but there is always a risk that it won't go well. Women usually make a point to hitch with at least one other person to reduce their risk level. Theft - Since hikers are carrying over $2,000 in gear, and some cash, you might expect more robberies and thefts. This turns out to be fairly rare, but it does happen. Cameras and electronics are more at risk than your water filter. Bears and Mountain Lions - Kind of like a shark attack, very high fear factor, but very low incidence. I'm not aware of any actual attacks on PCT hikers ever. Bears will sometimes false charge hikers and mountain lions will sometimes follow hikers though, both of which can be very scary. Snakes - I saw over a dozen rattlesnakes in both 2017 and 2018, but there wasn't really any danger from them as long as you didn't get too close. People aren't part of the "prey template" for a rattlesnake ... we are just too big to eat. Avalanche, Rock falls, Pine Cones, Branches, and Tree falls - I would like to say that this never happens ... but sometimes nature just seems to fall apart. It's very rare that PCT hikers get caught in the actual event. Once I had to dodge a heavy falling oak branch, but not on the PCT. Burn areas are the worst for tree falls. Please let me know if I've left off any important risks that you would mention, or if you have other comments about this topic. Thanks. Probably not as much of a risk on the PCT than on the AT - but strangers from the outside world. Would not have thought this was an issue until I discovered that my now daughter in law's aunt was murdered on the AT back in the early 1980's. Very famous story. Google Molly LaRue. FYI - I have done both PCT and AT. Wow, I wasn't aware of that story. It would be a legitimate add to the list, but I'm trying to keep it as short as I can without leaving off things that have actually happened recently on the PCT. Never use your camp stove for warmth 2 reason obviously fire and carbon monoxide poisoning. Thanks for the safety tip. Sometimes people do cook inside their tent on the PCT, but not with the tent closed up completely, mostly because of mosquitoes, which can be fierce.